IRAQI FORCES SEIZED a key military base, an airport and an oil field from Kurdish fighters today in disputed Kirkuk province in a major operation sparked by a controversial independence referendum. The rapid advance, which follows weeks of soaring tensions between two US allies in the battle against the so-called Islamic State (IS) group, aims to retake oil and military sites that Kurdish forces took over during the fightback against the jihadists. The US-led coalition against IS urged the two sides to “avoid escalatory actions” and focus on fighting the extremists, who are on the verge of losing their last strongholds in Iraq. Thousands of residents were seen fleeing Kurdish districts of Kirkuk city, heading in buses and cars towards the autonomous Kurdistan region of northern Iraq. “We’re leaving because we’re scared there will be clashes” in the ethnically mixed city of 850,000 people, 51-year-old Chounem Qader said. At the same time crowds on the streets of Kirkuk’s southern outskirts welcomed Iraqi forces as they entered the city, where they were seen raising Iraqi flags in place of Kurdish ones. Iraqi and Kurdish peshmerga forces exchanged artillery fire early today south of the capital of the oil-rich province, after the launch of the operation last night which triggered a spike in oil prices on world markets. A Kurdish health official said at least 10 peshmerga fighters were killed and 27 wounded during fighting overnight, but there was no confirmation of the toll from the Kurdish government. The rapid progress of Iraqi forces suggested that Kurdish fighters were withdrawing with little or no resistance in many areas. Iraq’s Joint Operations Command said its forces had retaken the K1 military base northwest of Kirkuk, the military airport east of the city and the Baba Gargar oil field, one of six in the disputed region. The operation follows an armed standoff between Kurdish forces and the Iraqi army prompted by a non-binding referendum on 25 September that produced a resounding ‘Yes’ for Kurdish independence. Baghdad has declared the vote — held despite international opposition — illegal. Iraqi Prime Minister Haider al-Abadi said the operation was necessary to “protect the unity of the country, which was in danger of partition” because of the referendum. “We call upon all citizens to cooperate with our heroic armed forces, which are committed to our strict directives to protect civilians in the first place, and to impose security and order, and to protect state installations and institutions,” he said. Peshmerga forces loyal to the Patriotic Union of Kurdistan (PUK), a political party linked to Iraqi President Fuad Masum, who is himself a Kurd, were reported to be withdrawing from areas under their control. The PUK had supported a UN-backed plan for negotiations with Baghdad in exchange for dropping the referendum. 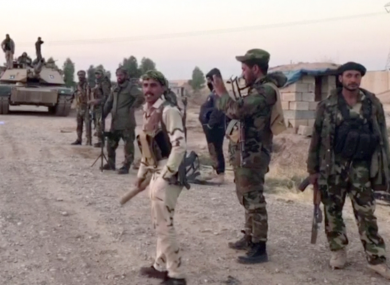 Pro-PUK forces were deployed south of the city, including at oil fields, while fighters loyal to the rival Kurdistan Democratic Party (KDP), linked to Iraqi Kurd leader Massud Barzani who initiated the referendum, were deployed to the north. Two people were killed in artillery exchanges at Tuz Khurmatu, 75km south of Kirkuk, a doctor at a city hospital said. The US-led coalition against IS called for dialogue between Iraqi and Kurdish authorities. “All parties must remain focused on the defeat of our common enemy, ISIS, in Iraq,” Major General Robert White, a commanding general in the coalition, said in a statement. The coalition said it was aware of reports of clashes but they appeared to be the result of a “misunderstanding and not deliberate”. Yesterday, Iraq’s National Security Council said it viewed as a “declaration of war” the presence of “fighters not belonging to the regular security forces in Kirkuk”, including fighters from Turkey’s outlawed Kurdistan Workers’ Party (PKK). The Kurds have been in control of six oil fields in the Kirkuk region providing some 340,000 of the 550,000 barrels per day exported by the regional administration. The fields would provide crucial revenue to Baghdad, which has been left cash-strapped from the global fall in oil prices and three years of battle against IS. Email “Iraqi forces seize ground from Kurds amid soaring tensions between two US allies”. Feedback on “Iraqi forces seize ground from Kurds amid soaring tensions between two US allies”.